Lucy Casino will then reward you with a bonus (Welcome Bonus is for new players only). The terms and conditions of the bonuses vary between different casinos and might also change over time and between different countries, so it is important to compare the different offers and read the T&C for Lucy Casino before signing up. Lucy Casino belongs to Jumpman Gaming casino network, a software company founded in 2012 that specialises in white label products and operates the UK focused bingo network. The casino is available to international players as well, which is why this operator hold two licences, issued by UK Gambling Commission and Alderney Gambling Control Commission. The UKGC authorises the operator to provide gambling services within the United Kingdom, while AGCC is in charge for residents outside the UK. The casino restricts certain territories and if you are a resident of one of the following countries, you will not be able to play at Lucy: USA, Russia, France, Spain, South Africa… The full list is available under Terms and Conditions, along with the extensive RTP list for the slots available on Lucy Casino platform. As an instant-play gambling site, Lucy Casino can be launched on desktop, smartphones, and tablets. Their software is SQS approved and easy to navigate, allowing the players quick access to hundreds of games that are divided into the following categories: Hot Slots, My Faves, Jackpots, and Bingo. The most popular releases are placed under the Hot Slots category, where you can find Burning Wins, Centurion, Starburst, Great Rhino, Bonanza, 88 Fortunes, Rainbow Riches: Drops of Gold, etc. Every time you launch a game, the casino will save it under My Faves, creating your very own list of favourite titles. The gaming selection at Lucy Casino is frequently updated to include the latest releases by Microgaming, NetEnt, Elk, Eyecon, Pragmatic Play, Playson, Gamevy, Big Time Gaming, Yggdrasil, Foxium, etc. Although there is no separate category for casino games, Lucy Casino does offer European Roulette and a Blackjack game, which you can find using the search bar to the right. Both of the games are released by Gamevy and the members will need to deposit before being able to play them. This is pretty much it, as far as the table games are concerned, but Lucy Casino does have a separate Bingo platform. Once you are ready for some diversity, you can use browse through Lucy Casino offer in search for Spinlotto, Boss the Lotto, Poke the Guy, and Tennis Scratch. Bingo fans will be able to play for free or buy Bingo tickets for the price of 1p-50p. The total prizes range from £0.50 to £1,000 and the available variations are Free Bingo, Lucky Stars, VIP Free Bingo, Pay Day Jackpot, and Fair & Square. 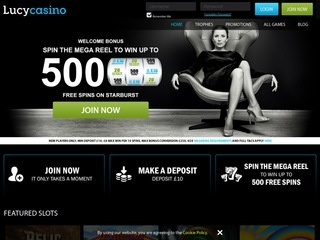 Although the operator partners with software providers that own Live Casino studios, Lucy Casino does not offer any Live Tables, nor are they likely to be included in the future. Lucy Casino members can only deposit in GBP and the available methods are Visa, MasterCard, Maestro, Paysafecard, PayPal, or Pay by Mobile. Up to 3 cards can be added to your cashier and the minimum deposit is £10. When you create your casino account, you will immediately be diverted to the banking screen, where you will be offered an option to select the payment method and choose the deposit amount: £10, £20, £50, £100, or £200. Up to £100,000 can be transferred over to the casino wallet and the members will be able to adjust their own depositing limits. Players who decide to use Pay by Mobile will have to cover £2.50 processing fee on deposits of £5, £10, or £20. The payout requests can be submitted two days after placing your first deposit and spending at least £10 on bets. The casino will need up to three days to process the withdrawal and approve it. For higher amounts, additional documents may be required, especially if the members are withdrawing progressive jackpots. If the player does not provide the necessary information, the request will remain pending up to 7 days. The casino will then simply cancel it without releasing funds. 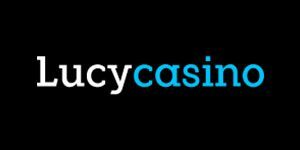 Questions regarding your account, banking policy, technical issues, or wagering requirements can be referred to Lucy Casino customer support that can be reached via email or chat. The agents will be ready to address your concerns during business days, from 2 pm to 6 pm. The customer service email address is [email protected] and you can expect a response within 24 hours.